Barranquilla is Colombia’s fourth largest city with a population of about 1.2 million people. It’s a major port city located on the north side of Colombia along the Caribbean coast about equidistant between Santa Marta and Cartagena. Strategically situated along the Magdalena River just five miles from the Caribbean Sea, Barranquilla is a port for river and maritime transportation within Colombia. It is also the main industrial, shopping, educational, and cultural center of the Caribbean Region of Colombia. Barranquilla is nicknamed “Colombia’s Golden Gate”, because it was the gateway for progress in Colombia. Aviation, telephones, radio, trains, and fútbol (soccer) all came to Barranquilla first. Usually the first thing that comes to mind about Barranquilla is Carnival. 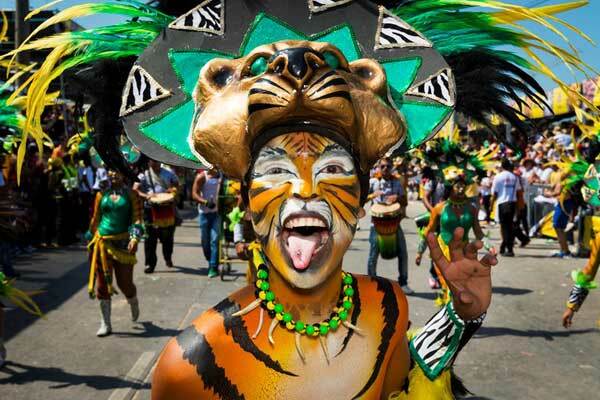 Second in size only to Carnival in Rio de Janeiro, Brazil, the event runs for the four days before Ash Wednesday and attracts over 240,000 visitors from all over the world. 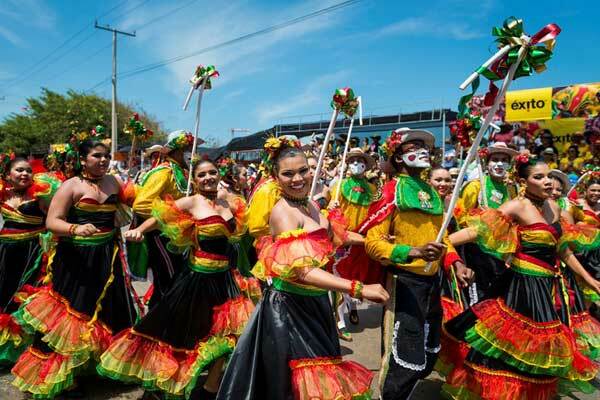 Known for its parties, parades, dances, and music, Barranquilla Carnival earned UNESCO intangible cultural heritage designation in 2003. Barranquilla is known for its cumbia dancing. Cumbia began as a courtship dance practiced among the African population on the Caribbean coasts of Colombia. It later mixed with European instruments, steps, and musical characteristics. By the 1940s, cumbia began spreading from the coast to other parts of Colombia. Soccer is the most-followed sport in Colombia. The city of Barranquilla boasts the 50,000-seat Estadio Metropolitano Roberto Meléndez, home stadium of the Colombian national football team. Fans from all over the country descend upon the city to watch their team (nicknamed Los Cafeteros) compete in World Cup qualifying matches. Shakira, the award-winning singer and songwriter, was born and raised in Barranquilla. Her compelling voice and hip-swinging dance moves earned her many Grammy and Latin Grammy awards. She is one of the city’s best ambassadors. While Barranquilla is most well-known for its Carnival and attracts tens of thousands of tourists every year for New Year’s celebrations, it is still relatively off the beaten path for North American retirees. However, the city has been attracting people from all over the world for decades to study and set up businesses, so there is a very cosmopolitan feel and vibe. To match its global population and tourists, Barranquilla serves a wide variety of cuisine. Restaurants serving Creole food as well as Syrian-Lebanese, Chinese, Japanese, Brazilian, Peruvian, French, Italian, Thai, and Spanish are scattered around the city. With so many options, dining out will never get boring. There are plenty of sports to keep you active and full of vitality. In addition to the soccer stadium, Barranquilla also has an Olympic-sized swimming pool, a shooting and skating rink, inside a roller hockey court, tennis courts, a BMX track, and a bowling alley. Retirees want access to high-quality healthcare. Barranquilla has a large number of public and private hospitals and clinics that can handle anything from regular checkups and diagnostics, to high-tech procedures and medical specialties. Expat retirees are drawn to the Alto Prado neighborhood north of the historic center of the city. This area is considered one of the best middle-upper class neighborhoods in Barranquilla with residential buildings, shopping centers, and offices. The area around Washington Park has most of Barranquilla’s bars, pubs, and nightlife options. Another area that resonates with retirees is the neighborhood of El Prado, also known as Viejo Prado, a historic area with a unique atmosphere in the city of Barranquilla. This neighborhood, to the northwest of the Historic Center, stands out for its houses, gardens, and mansions of different styles. Some of El Prado’s large mansions have been transformed into boutique-style hotels. Barranquilla has a warm, tropical climate. The sun is strong. Don’t take this lightly. You need to protect yourself with sunscreen, sunglasses, and hats. Average daily high temperatures range from the upper 80s F to low 90s F with 80 percent humidity. In the evening the temperature dips to the mid-70s F, which makes walking about the city quite pleasant. Air-conditioning is needed so your electricity costs will be higher in Barranquilla than in the more temperate mountain cities of Medellín or Bucaramanga where you can live without cooling or heating. Getting around Barranquilla is relatively easy. The city has Transmetro, a two-line, elongated bus system, with 29 routes, several with dedicated bus lanes. Like many coastal Colombian cities, the taxis in Barranquilla are not metered. Always make sure to ask the price before getting in a taxi so that you are not surprised by the cost of the fare when you reach your destination. Ernesto Cortissoz International airport is the fifth largest airport in Colombia based on number of passengers. Both American Airlines and Avianca offer direct, three-hour flights between Barranquilla and Miami. Located in the southeastern part of the city in the La Victoria neighborhood is the Barranquilla Botanical Gardens. It is a seven hectare community and recreational green area for public use. Enjoy the lush vegetation and clear water springs that provide a perfect environment for rare native plant and animal species within the city limits. Barranquilla’s arts and cultural scene is alive and well. You can enjoy live performances and readings at the restaurant-bar La Cueva (the cave). For a fascinating insight into the history and culture of Colombia’s Caribbean coast, visit El Museo del Caribe the best museum in Barranquilla. Providing a fun and interactive experience, this museum is split into several levels and rooms, each displaying different elements of the culture. A special area dedicated to writer Gabriel Garcia Marquez contains an exposition of his best work and is a great place to sit down and read one of his short stories or novels. No city has a “one-size-fits-all” cost of living. 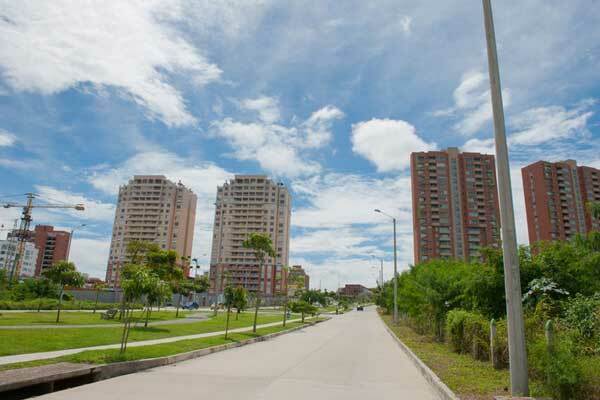 However, in Barranquilla it is possible to tailor your lifestyle to your budget. You can live in a high-rise in the upscale neighborhood of Alto Prado, or a more moderate townhouse just outside of the city center. Shop in the malls or buy your clothing in local mom & pop shops. Eat out every night or cook at home from food bought at a farmer’s market. In general, the cost of living in Barranquilla is 60% to 70% less than the coastal U.S. cities of Miami and Ft. Lauderdale. The savings is the same for the northern cities of Boston and Chicago.